Location: A side entrance to Khazad-dûm on the western slopes of the Misty Mountains, southwest of Caradhras; built in the Second Age to facilitate trade between the Elves of Hollin and the Dwarves of Moria. Later some of the Noldor went to Eregion, upon the west of the Misty Mountains, and near to the West-gate of Moria. This they did because they learned that mithril had been discovered in Moria. The Noldor were great craftsmen and less unfriendly to the Dwarves than the Sindar; but the friendship that grew up between the people of Durin and the Elven-smiths of Eregion was the closest that there has ever been between the two races. 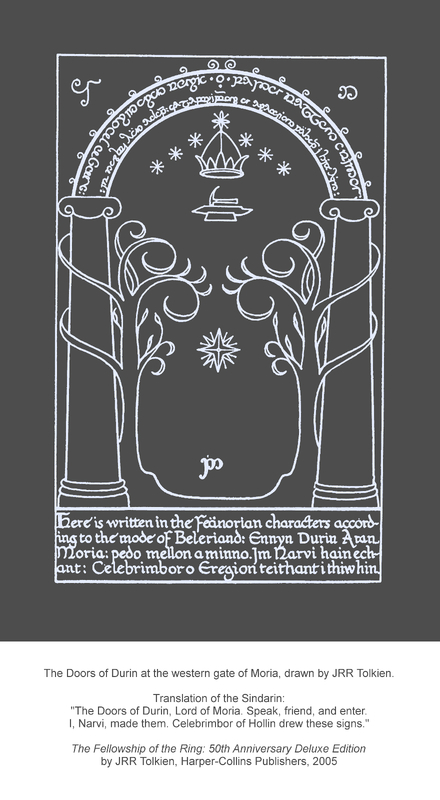 Celebrimbor was lord of Eregion and the greatest of their craftsmen; he was descended from Fëanor. 'There it lies,' he said, pointing away south-eastwards to where the mountains' sides fell sheer into the shadows at their feet. In the distance could be dimly seen a line of bare cliffs, and in their midst, taller than the rest, one great grey wall. 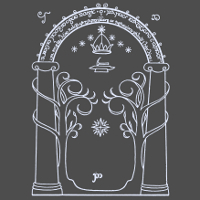 The Doors of Durin at the western entrance to Moria. The Moon now shone upon the grey face of the rock.... [Slowly] on the surface, where the wizard's hands had passed, faint lines appeared, like slender veins of silver running in the stone.... [They] grew broader and clearer, until their design could be guessed. 'There are the emblems of Durin!' cried Gimli.